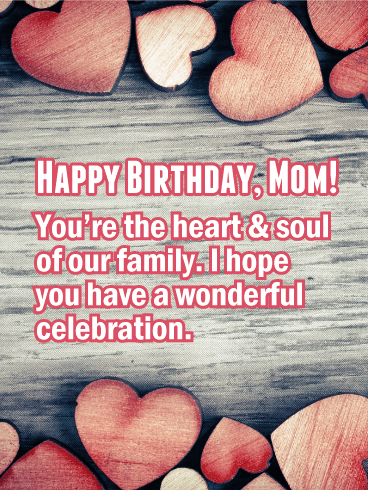 It's your mom's birthday and you want to let her know how much she brightens your world. This birthday card is a wonderful choice! A colorful cake is lit up, with beautiful lights in the background and a festively wrapped gift. It's all waiting to wish her an unforgettable celebration and a year ahead filled with love and happiness. Nobody deserves it more. 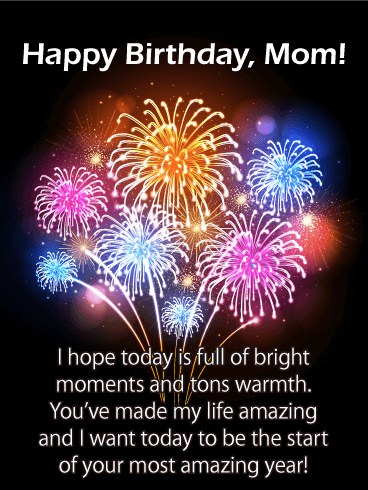 Mom, Another year means another chance for me to tell you how much you brighten my world. Happy Birthday! This birthday card is perfect for any mother, but would especially mean a lot to a crafty mom on her birthday! 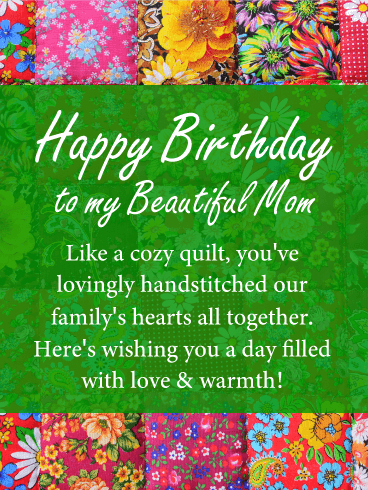 Happy Birthday to a beautiful mom is emblazoned on the front of a gorgeous quilted background full of various flower fabrics! This birthday card would also be an excellent choice for a mom who loves florals and/or anything to do with gardening! A vase filled with beautiful pink blooms is on display, with a rich blue background adding warmth and charm. It's a special way to say "Happy birthday" to your mom and to wish her joy in the year ahead. The words are sentimental, reminding her to take the time to enjoy all the beauty and love that surround her, while letting her know how important she is to your life. It's the kind of greeting that will touch her heart for a long time to come. 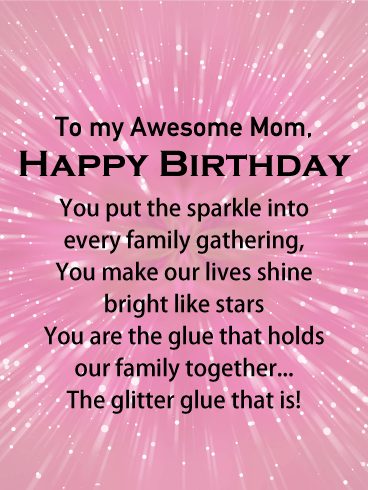 If your mother was glue, she'd be glitter glue that's how awesome she is! 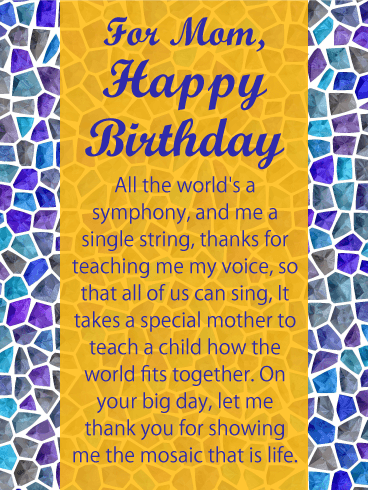 She deserves to be reminded of how special she is to you and the rest of the family, so send her this gorgeous card! 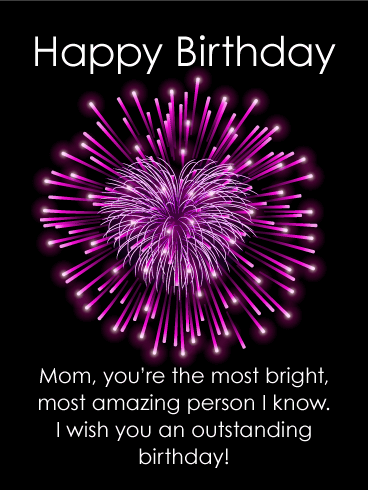 This happy birthday card for mom positively sparkles and shines! 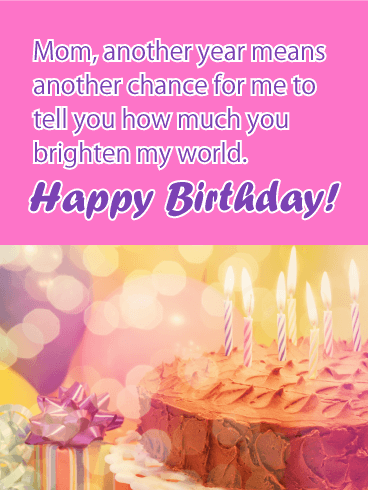 The pretty pink background and sweet message is sure to make her feel all the love this birthday! A row of pretty pastel balloons and a background of soft light create the perfect setting for a celebration: one for someone very special. This year, on your mom's birthday, let her know how much she means to you with this lovely card. It's a warm reminder of the loving person she is and a chance to wish her the very best today and in the year ahead. Your darling mother has always been there for you, encouraging you to chase your dreams and never give up hope! 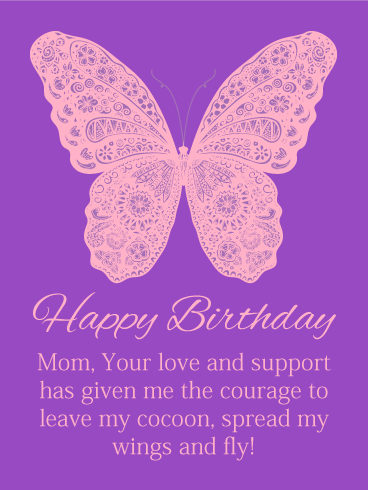 Wish her a very happy birthday with this beautiful, purple butterfly card. 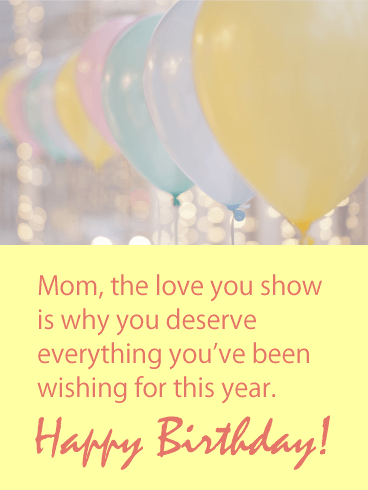 By sending her this card you accomplish both wishing her a happy birthday and letting her know how much you appreciate the support she's always openly given to you through the years! 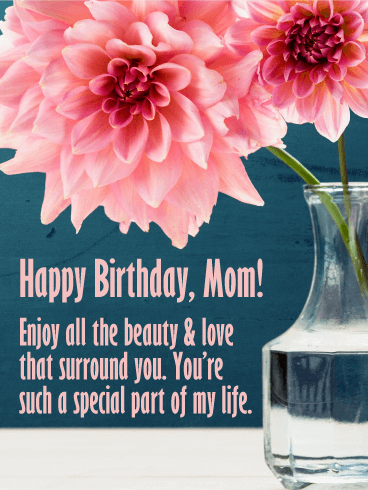 Your mom holds the most important place in your heart, which is reflected here in this lovely birthday card. A rustic background with heart-shaped wood carvings adds a charming touch. 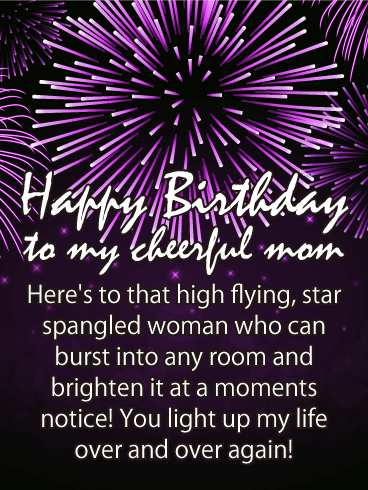 And the sentimental words, wishing her a wonderful celebration and letting her know how much you care about her, will make her feel loved not just today, but every day after. Other moms better take note! 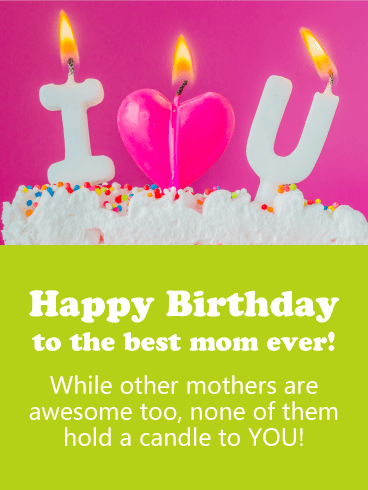 Your mother is a SUPER mom and you want the whole world to know it, so send her this happy birthday card on her big day! With playful pinks, a hint of tasty cake, and giant candles that spell out "I heart U" this birthday card is anything but shy! The message is pretty clear, Happy Birthday to the best mom ever! No room for arguments here! Birthdays are for family, fun, and dessert! Remind your sweet-tooth mom that on her birthday she deserves to eat as much cake as she wants by sending her this cheerful blue polka-dotted happy birthday card! 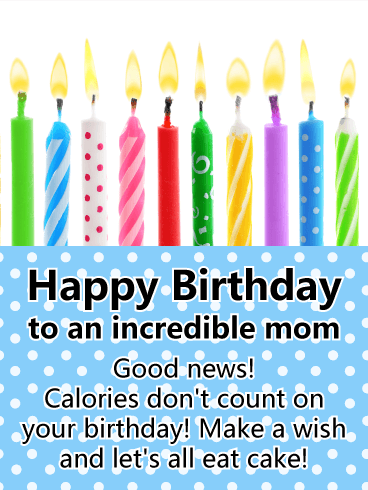 The birthday card with it's lit candle line-up will remind that awesome lady that even if she's on a diet - calories don't count on your birthday! Talk about a wish coming true!